"Learn NLP At Home From One of The Top NLP Trainers in the World Absolutely FREE!" Ten Hours of NLP Videos! We will never share your contact info with anyone else and you can unsubscribe anytime. Hi there, my name is Michael Stevenson. If you've been trying to learn NLP, you know how frustrating it can be to find good, quality information online that doesn't cost an arm and a leg. As an NLP Master Trainer myself, I spent thousands of dollars and months of my life learning these powerful tools called Neuro-Linguistic Programming you can use to master your mind and influence and persuade others easily. Over the past twenty-one years, I have lived my passion and created a happy fulfilled life doing what I love — teaching NLP. I am full of gratitude to those who have helped me create the success I now enjoy. So, now I'm going to pay it forward... to you with the Free NLP Home Study video course. NLP is the study of excellence. It's a technology of the mind that lets you master your life. Many very successful people like me have used NLP to create their success in life. The list includes Pharrell Williams, Tony Robbins, Derren Brown, Paul McKenna, Bill Clinton, George W. Bush, Tony Blair, Phil Jackson, Oprah Winfrey, Tiger Woods, President Barrack Obama and so many more! Because these tools are so powerful, the cost of learning NLP is usually HUGE. But I'm changing that, and now you can get my 10 hour NLP video training course, absolutely free. "Why Learn NLP? Look at What Some of the Most Successful People in the World are Saying About It..."
Learn to Take Control of Your Emotions and Your Thoughts. Overcome Bad Habits and Create Positive Habits, Too! NLP Will Give You BACK the Power In Your Life You Never Even Knew You Could Have! "Michael's Trainings Have Consistently Been the Best I've Ever Taken"
"Michael Makes the Study of NLP Easier and Simpler"
"I trained with NLP founder Richard Bandler in the late 1980s. Michael makes the study of NLP easier and simpler than even that." As soon as you register for free and get instant access, you will be empowered with new ideas, strategies and tools to create success in your life. 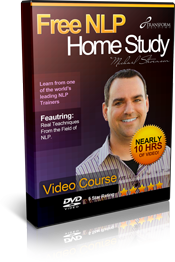 What's Included in the Free NLP Home Study Course? This video training, recorded from a live event, will teach you what NLP is and how to use some of its most incredible tools for taking control of your mind and your life and learning to communicate well and influence and persuade others. ~12 hours. FREE registration - no strings attached! I normally sell these programs through my company, Transform Destiny, for hundreds of dollars. But, today, I'm giving them to you for free. "I have never felt as supported, as encouraged, as inspired in any other course of learning as I have with Michael and Transform Destiny"
"Michael Has Surpassed Every Expectation"
"He Goes Far Beyond the Call of Duty and Gives you More Than You Could Ever Expect to Pay For"
"You Can Just See Feel and Hear His Passion for Both NLP and Transforming the Destinies of Each and Every Student." "Michael is a dynamic empowering speaker. You can just see feel and hear his passion for both NLP and transforming the destinies of each and every student. His teachings have been life changing for me and has opened me up to infinite possibilities. Michael is a best-selling author, international speaker, Certified Master Trainer of Neuro-Linguistic Programming, and a Certified Master Business and Success Coach. Michael has more than ten years of practical experience in his own clinical practice. He is the author of the book, Learn Hypnosis... Now!, which teaches people who have never used hypnosis to hypnotize themselves and others in just a few hours. He has hypnotized tens of thousands of people around the world and is considered one of the world's foremost experts on the subject of NLP and hypnosis. You can contact Michael directly via phone, mail or email, here. Author of the Best-Selling Book, Learn Hypnosis... Now! Author of the Book, The Power to Create Your Day Now!